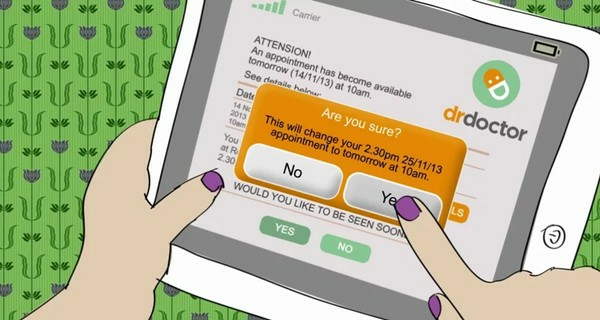 DrDoctor is a simple, user-friendly health SMS and web tool for patients to interact with the NHS. Considering how digital everyday 21st century life is, this may sound very far from rocket science. However, healthcare lags well behind other sectors in embracing customer-centred online tools, with only 1% of patients in the UK given the option to manage their medical appointments electronically. Since most first referrals to hospital are sent by post, patients have no flexibility to make changes, and little in the way of extra support or information. This can make life difficult for people who are newly diagnosed with serious conditions, and are left in an anxious information vacuum; also for those with chaotic lives or those with certain serious diseases, dementia for instance, for whom carrying out just simple administrative tasks, such as changing an appointment, can be hard. DrDoctor has been trialled in two hospitals, and as well as improving patient experience, it’s demonstrated that the more information patients have, the more likely they are to attend the appointments that speed up their recovery. It’s also shown to cut the time the staff in call centres and booking teams spend on day-to-day patient admin, leaving them to prioritise face-to-face needs, and very specifically stands to save the NHS millions in late cancellations. Whereas most patients give such short notice of a no-show that staff are unable to find replacement patients, DrDoctor automatically finds and alerts patients waiting to be seen, prioritising people based on how clinically urgent it is that they get care. Individual clinics and hospitals can adapt the site: they can reserve capacity for emergency walk-ins for instance, and add in information on where to park.